17 personalities currently on file. Unusual Features: Being half patheon lord and half Territaani, Euriel's body tissue is three times as dense as that of an ordinary mortal. She is therefore far more durable and stronger than an ordinary woman of her height and build. Being half immortal she ages extremely slowly. Additionally, her enhanced metabolism allows her wounds to heal very rapidly. Despite the extra weight, it takes a great deal to fatigue her. In fact, when in battle her body actually feeds on energy of the conflict allowing her to push even harder and faster. Magical Skills: Euriel is first and foremost an Aesir warrior. However, like the scalds of old, no warrior is complete without delving into the lore and animus of the deep magicks. She is a powerful magician that, not surprisingly, focuses on battle-magic. She has skills equal to a loremage, but with her extended life has considerably more knowledge and access to arcana than a mortal sorceress. Her extremely tough body and almost limitless endurance allow her to use magic that would slay a mortal, thus she can perform magics beyond the scope of her skills. Tournament Rank: Euriel is an unlimited class warrior. Being an elder and bred for war, the tournament is what Euriel looks forward to in every year. She always places well. Her extraordinary physical powers, Aesir instinct for battle, and experience make her a worthy adversary even for those with much greater skills. The extraordinary warrior Beia Targallae has only bested Euriel once in tournament. Their rivalry continues as Beia trains each year to even their record. Information: Euriel is the daughter of Idun Yggdrasil, the Aesir keeper of immortality. Her father was Cohr, a Territaani warrior that Idun happened to meet in her travels among the fringe worlds. Euriel grew up as most children of the pantheon lords do, envied by their "betters". She was strong and quick and an exceptional student. She fought in many skirmish wars along side the Chosen and learned most of her fighting skills from the Valkur maidens. One of the mortal games that Idun patronized was the All-Worlds Tournament, and Euriel grew up as a young woman dallying with the handsome young men of the lists. It was there that she met Vanidaar Kergatha, a, then, young savant of life forces. The two of them began seeing one another and a few summers later were married with the blessing of Idun. It was sometime later that she was able to conceive of Son whom they named Azir. Surprisingly, they learned the boy was a savant, something very rare for a coupling with one parent who was a savant. More surprisingly, four years later, Euriel was able to conceive again... this time with a daughter who they named Liandra. To their dismay, she too was a savant, and this time one of the prime savants. It was this dual birthing of savants that made Euriel a target for Hecate and caused Liandra and Azir to be stolen from her by Mishaka the Avatar. Unusual Features: DacWhirter is a dwarf, but unusually large for his kind. Magical Skills: None-- DacWhirter is extremely *resistant* to magic as is most of his kindred. Tournament Rank: DacWhirter is a 9th ranked WarMaster and veteran of 20 All-World's tournaments. He has at times qualified and made it to the final rounds the unlimited class tourneys. These inconsistent showings in tournament play have raised the question if there might not be more than one dwarf baring the name of DacWhirter Ironfist. Information: Sometimes known as the Warmaster of Kron. Member of the Band of the Crescent Moon. DacWhirter hales from the Kron hills in the Kingdom of Coormeer to the east of Ivaneth. 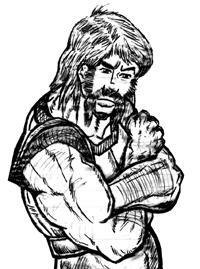 This hardy dwarf has taken part in a great deal of the lore of Titaan. He has been rumored dead several times only to reappear summers later as though nothing had happened. Through what magic he accomplishes this is still unknown. There are those who theorize that he is an agent of Moradin, who favors him with renewed life after sacrificing himself in the cause of protecting life in the Ring Realms. If this is the case, DacWhirter has never favored anyone with his secret. Measuring 16 hands tall and weighing over 22 stone DacWhirter is one of the biggest dwarves recorded in the realms. Unusual Features: The lean pantherish physique that so many have come to recognize and appreciate is not Terra's true or original form. Terra is not human, but a member of a race of magical creatures known as Sphinx-kind. Terra herself is noble of their kind, with magic and powers considerably stronger than those of "lesser sphinxes". Spinxes are known through the realms as the riddle-masters and guardians. They often portray themselves as half-humanoid/half-beast in order to strike fear into creatures that would disturb the treasures they are often contracted to guard. Terra, like most of her kind is a powerful shape-changer and can permanently take any form she chooses. Her natural form, that of a huge albino feline somewhat resembling a tiger has only been seen by her husband Tal and a few close friends. Members of Sphinx kind are extremely long lived, with lifespans measuring in millennia. Now that Terra wields the Shaladen Jemfire, she no longer ages at all. Magical Skills: As a lore-wise member of the sphinx race, Terra has a sage's understanding of magic and magical phenomena. She possesses a number of innate magical talents for recognizing and seeing through magical auras and glamours. She wields a large number of minor utility magics that she can cast at will without concentration. She is, as earlier noted, a master shape-changer. She however, does not often make large changes in her appearance. Terra possesses a number of psionic talents that include healing and telepathic communication. Tournament Rank: Terra is an unlimited class warrior and extremely formidable when provoked. However, she is not particularly interested in the notoriety of holding a top rank so consequently she has never really pushed to achieve her full potential. Terra has placed in the top ten in 13th and 14th circle challenges. She has never made it past the round of 16 in the double elimination of the unlimited class. Information: Born with the name Baerwin, Terra was something of a rogue and a wanderer her entire life. As a member of Sphinx-kind she was sworn into a guardian contract when still young. She completed that duty after a hundred cycles and was free to wander the planes. She took a mate (Jhalon Malad) who was a member of one of the highest houses of Sphinx nobility. After a few decades she bore him a son and daughter, who she brought up as somewhat rebellious youth of their kind. Some century later, Jhalon died in the completion of guardian contract. 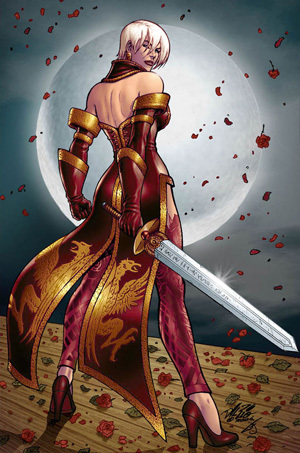 Her children grown, and not particularly popular with the royal family, Terra returned to wandering the planes. In her many jaunts through the inner spheres and courts of the pantheon lords, she became aware of the group of magicians that called themselves the Dream Merchants. This powerful coven of wizards were the purveyors of "desire" able to make wishes into reality (or so they claimed) as long as the recipient had sufficient gold. She was so fascinated by their operation that she set about getting a position working for them. The Dream Merchants were more than willing to sign on a plane-savvy member of the Sphinx race. She was quickly assigned a guardian and advisor for negotiations. For many cycles, Terra was satisfied to visit the worlds and places where the dream merchants did commerse. She, and this was her main goal, spent time learning secrets of the merchant's powerful magics. It was through the dream merchants that Terra learned of the Kriar and the huge legacy of artifacts that their race had left untenanted in Realms. The Protectorate war had killed the first wave of Kriar that had been exploring the realms. After their loss at the hands of the Eternals and the rogue Garfang, the system of Kriar time portals and dimensional gateways were left unguarded and open to abuse by any who had the magic and ingenuity to missuse them. Terra set out to learn how to utilize these ancient artifacts, and after many decades was using them to jaunt all across the Ring Realms. It was during this period of time that Terra became aware that she was not the only one taking advantage of these ancient relics. An evil wizard named Meridian Arcturus, was using them to transport men and supplies to outposts throughout the realms. He was building fortifications above many of the gateway access portals and gaining immense power. Not particularly wanting to share, she began a campaign to limit and control the use of the Kriar gate technology. She discovered a way to activate the gate guardians and then set about the process of going from world to world through the realms locking down the gates to prevent the further spread of Meridian's Death Spectacles. Terra had been taking a rest from her long campaign of locking the gates when she came into contact the Band of the Crescent Moon. When she learned of their current quest to assemble the amulet of Tarkimaar and challenge the timelord Hellzan she decided to help. Never knowing that she was not human, the band accepted Terra as they did many of their other fellows, with open arms and comradery. She became close friends with Algernon, T'Gor, Beia and Damrosil. T'Gor and Beia, she learned, she had something in common with, they too were fighting Meridian. This being her first time to have a relatively close relationship with people, Terra stayed in contact with the band after the successful completion of their battle and subsequent defeat of Hellzan. She would later assist Damrosil in some of her quests to undermine the dream merchants (Terra's former employer). Through Damrosil, Terra would eventually meet Tal Falor. The burly warrior took a shine to her, and began a campaign to court her attentions. It was never really in question, but being cattish, she drew it out as long as possible... Her final test was to reveal to him her true nature. Instead of being run off, Tal accepted that she was not human. At her behest they decided to be trial partners for a few cycles to see how it worked out. After five cycles they were married. Tal and Terra have been steadfast partners ever since. Group Affiliations: Felspar family, Starholme Prime Trustees, Ivaneth Thieve's Guild, Jhandris'Kul clan of Myrmigynes in the ribbon realms. Tournament Rank: 12th Circle (acknowledged), has competed in unlimited play. Information: Daughter of Eurel and Vanidaar Kergatha. Fifteen summer vetran of the Brethren guild. Wren is a Kel'Varan Nola a savant of forces. Wren has had dozens of run-ins with the pantheon lords and their servants. She has fought several avatars and permanently killed two. Even Hecate speaks of this young woman with grudging respect... knowing her full potential especially when backed by the proper allies.